In 1993, as Korg/Vox was trying to develop the most accurate AC-30TB reissue ever attempted, they faced a number of obstacles. The largest was the Celestion/Vox Alnico blue loud speaker. It hadn't been produced for 25 years, and for good reason. The Vox Alnico Blue has an alnico magnet. An alnico magnet is made of an alloy of aluminum, nickel, and cobalt (hence the name - Al Ni Co) The third component in the alloy, cobalt, is the problem. Most of the world's supply of cobalt comes from The Congo. The Congo nationalized it's cobalt mines in 1967 and limited production to push up the market for the mineral. These actions drove up the price of cobalt to a point that it became unfeasible to use alnico magnets in speaker manufacturing. By the middle 1970s, most speaker manufacturers dropped alnico magnets, replacing them with focused field ceramic or ferrite magnetic structures. Alnico magnets offer several significant benefits for speaker performance. Alnico is an intensely powerful magnet. A very small alnico magnet is often more powerful than a much larger and heavier ferrite equivalent. This increased magnetic strength (or "gauss density") offers improved tone. Additionally, the strength of an alnico magnet does not fade with heat, as is the case with ferrite magnets. If a ferrite speaker is driven hard for several hours, it requires more wattage to produce the same amount of acoustic output when cold. Alnico speakers do not exhibit this heat induced volume fade. 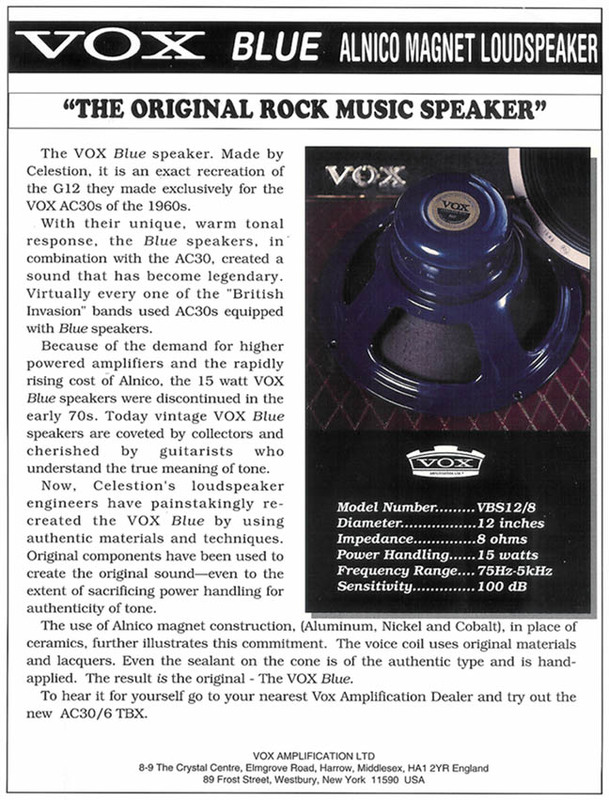 In 1993, Vox approached Celestion about once again making the "alnico blue." Vox convinced Celestion that the market would accept a 12" 15 watt guitar speaker that would cost over $300 retail, especially if installed in a near perfect reissue of the 1964 Vox AC-30 Top Boost amplifier. Celestion agreed, and the rest is history. The following 1994 Vox advertisement announces the reintroduction of the Vox Alnico Blue.